MISSION ACCOMPLISHED! 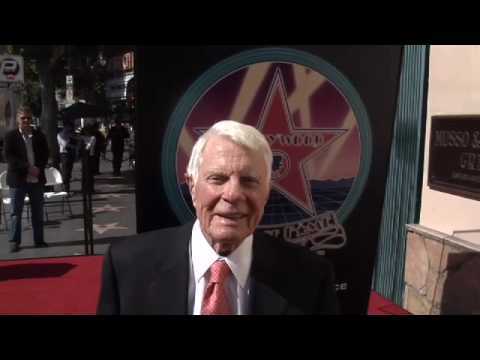 Peter Graves was honored with the 2,391st star on the Hollywood Walk of Fame. 6667 Hollywood Boulevard on October 30, 2009. Peter Graves has combined an enormously successful film-acting career - spanning the classic Stalag 17 to the hilarious Airplane - with an equally rewarding TV career, encompassing more than a half-dozen series, several major mini-series and numerous movies-for-television. Mr. Graves hosted A&E's flagship series "Biography" from 1987 - 2002. "Biography" garnered some of the network's highest ratings. In 1997, Peter Graves was himself the subject of an A&E "Biography" presented by co-host Jack Perkins. Signing on to head the "Mission Impossible" force for six of the seven years the original series ran on CBS-TV (1966-73), firmly established Graves as a star of international importance, a status that continues undiminished. When ABC-TV decided to bring "Mission Impossible" back to the home screen in 1989, they asked Graves to head the otherwise all-new cast. His other series credits include: Court-martial, Whiplash, Fury, and The Rebels; plus two Time-Life series of Discover: The World of Science. Additionally, he created the role of Palmer Kirby on ABC-TV's The Winds of War mini-series and reprised that role for War and Remembrance. Since his film debut in Rouge River, Graves has starred in a legion of leading roles in such motion pictures as Stalag 17, The Court-Martial of Billy Mitchell, A Rage to Live, The Raid, The Ballad of Josie, The Long Grey Line, Texas Across the River, Five Man Army, and others. Other motion pictures have included Spree, Number One with a Gun, Airplane II, Savannah Smiles, Survival Run, Cruise Missile, Black Tuesday, and Fort Defiance. A departure from most of his dramatic roles, Mr. Graves joined an ensemble cast that was a who's who of celebrity talent to play the airplane pilot, Captain Roger Oveur, in Airplane! Considered to be one of the 10 funniest movies ever made by the American Film Institute, Airplane! celebrated its 25th Anniversary in 2006 with various special DVD releases. Freeway, Death Flight, Underground Man, New Orleans Street Force, Where Have All the People Gone and The Memory of Eva Ryker. The Minneapolis-born Graves is also an accomplished musician, an affinity he developed early in his youth, when, in addition to athletics, he also found time to take on yet another interest: radio announcing. At the age of 16, he joined the announcing staff of radio WMIN in Minneapolis. Upon high school graduation, Peter enlisted in the U.S. Air Force, where he spent two years. He later went to college at the University of Minnesota, where he majored in drama. 2009 celebrated Mr. Graves' 59th year in show business and he is still going strong. He was a semi-regular playing the grandfather for an arc of the hit television series "Seventh Heaven." In the last year he has guest starred on FOX-TV's "House" and CBS-TV's "Cold Case." And of course, he now finds it hard to not be recognized in public due to the frequent airings of his tongue-in-cheek Geico Insurance television ad spot. Graves was honored with a Lifetime Achievement Award from the Ojai Film Festival in a high-profile week leading up to his anniversary. The film festival honor was presented Nov. 7 in Ojai when Graves took questions from the audience following a screening of the comedy Airplane! Peter Graves has combined an enormously successful film-acting career – spanning the classic Stalag 17 to the hilarious Airplane – with an equally rewarding TV career, encompassing more than a half-dozen series, several major mini-series and numerous movies-for-television. Mr. Graves hosted A&E’s flagship series “Biography” from 1987 – 2002. “Biography” garnered some of the network’s highest ratings. In 1997, Peter Graves was himself the subject of an A&E “Biography” hosted by co-host Jack Perkins. Signing on to head the “Mission Impossible” force for six of the seven years the original series ran on CBS-TV (1966-73), firmly established Graves as a star of international importance, a status that continues undiminished. When ABC-TV decided to bring “Mission Impossible” back to the home screen in 1989, they asked Graves to head the otherwise all-new cast. His other series credits include: Court-martial, Whiplash, Fury, and The Rebels; plus two Time-Life series of Discover: The World of Science. Additionally, he created the role of Palmer Kirby on ABC-TV’s The Winds of War mini-series and reprised that role for War and Remembrance. A departure from most of his dramatic roles, Mr. Graves joined an ensemble cast that was a who’s who of celebrity talent to play the airplane pilot, Captain Oveur, in Airplane! Considered to be one of the 10 funniest movies ever made by the American Film Institute, Airplane! celebrated its 25th Anniversary in 2006 with various special DVD releases. 2009 celebrates Mr. Graves’ 59th year in show business and he is still going strong. He was a semi-regular playing the grandfather for an arc of the hit television series “Seventh Heaven.” In the last year he has guest starred on FOX-TV’s “House” and CBS-TV’s “Cold Case.” And of course, he now finds it hard to not be recognized in public due to the frequent airings of his tongue-in-cheek Geico Insurance television ad spot. Graves will be honored with a Lifetime Achievement Award from the Ojai Film Festival in a high-profile week leading up to his 60th anniversary. The film festival honor will be presented Nov. 7 in Ojai when Graves takes questions from the audience following a screening of the comedyAirplane! The recognition comes at an opportune moment: A DVD box set featuring all seven seasons of the classic spy seriesMission: Impossible was released Nov. 3.